Digitizing grids has shot up the priority ladder of utilities from a “should do” to a “must” — and it needs to happen soon. That’s because digitization is at the heart of future power distribution systems. It is transforming many areas of the electric utility business in order to boost efficiency and manage demand. Demand management allows utilities to optimize flexible loads by leveraging consumers’ own consumption. It’s an important innovation to maximize smart grid performance as utilities seek to incorporate and accommodate distributed energy resources (DER) and microgrids while simultaneously improving reliability and managing peak loads. 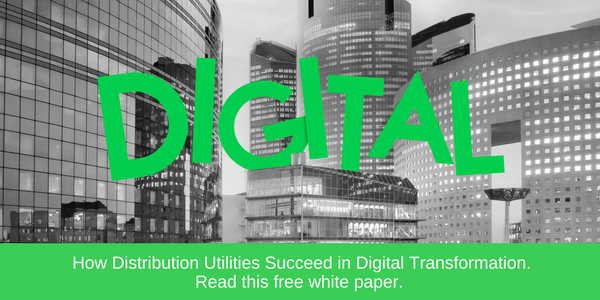 Until recently, distribution utilities were limited to ensuring optimal operation of purely passive networks, but today they have the capabilities to look downstream and adjust demand to meet the available supply. This flexibility is made possible through digital technology that incentivizes customers to change their behavior and adjust energy consumption. This customer engagement includes sophisticated, targeted consumption adjustments or localized responses, such as time-of-use electricity rates. Another example is utilities developing a pricing system for charging electric vehicles, which can manage electricity loads as great as those of a typical household, at times when power is inexpensive and readily available. The adoption of smart, digital technologies will have a huge impact on the efficiency of distribution grids improving all levels of utilities’ operations—from the physical network itself to more active energy consumers. Today, digitized, data-rich utilities can improve their operational efficiency by leveraging grid and energy analytics. Digital tools and services generate accurate insights and foresights by processing the data from automated controls and IoT-enabled sensors embedded across grid-connected equipment and devices. This information allows utilities to pinpoint problem areas that could lead to outages or losses and improve resilience, while at the same time smoothing DER integration to make the most of increasing numbers of variable renewable energy sources. Many utilities are also working closely with energy consumers to meet grid efficiency goals. Consumers have already embraced, and even come to expect, energy management solutions and services such as those that give them control over their usage so they can make more efficient, sustainable energy choices and decrease costs. At this point in the energy transition, utilities must seize the opportunity to become digital transformation change leaders. When they do—by taking advantage of today’s connected equipment, edge control and analytics technologies and services—they can achieve their most important goals. It’s the need of the day and the trend of the future. Good article indeed. Very good article on dizitization of electric distribution system.